My friend Elizabeth Colton Walls can be counted on for exceptionally good recommendations, and today she regales us with reviews of four top biographies. Being a Bassett of Bassett furniture fame was a good gig for a lot of years. As long as you could stomach working for one of your unreasonable, dictatorial, and micromanaging kinfolk, the pay was good, and the living, if not easy, beat the alternative which was not being a Bassett in Bassett, VA. And then came China’s admission to the World Trade Organization, and it all changed. Suddenly faced with an influx of cheap imports, the Bassetts and the other furniture families in the South, most of whom are related, made the necessary adjustments – widespread layoffs and closing factories by the dozens. John D. Bassett III (JB III), no longer associated with his eponymous company, made different decisions at his much smaller factory located down the road in Galax, VA. Blessed with personal wealth and chutzpa to match, he took on the Chinese. And won. Sort of. 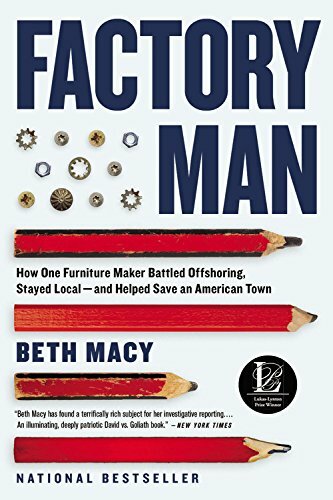 Beth Macy has written an eminently readable book about the destruction of the domestic furniture manufacturing business as told through the eyes of the Bassett who didn’t cave to the overseas competition. JB III’s company, Vaughan-Bassett, is one of the only sizeable factories left in the South manufacturing (not assembling) wood furniture. Macy is a journalist, not an economist. She competently tackles tariffs and global outsourcing, but the backbone of the book is the stories of the factory owners and their workers, both here and in China. Clearly her sympathies lie with the 300,000 unemployed furniture workers in North Carolina and Virginia, but she approaches the controversial issues with an even hand. Factory Man can be seen as the counterpoint to The World is Flat, whose author Thomas Friedman is the recipient of a few barbs by Macy. An entertaining and enlightening read. You will never look at a sofa from Restoration Hardware in the same way again. Royals make the worst parents. Take poor Edward VII or Bertie as he was known to familiars. Raised by aristocratic wolves (his parents Queen Victoria and Prince Albert), Bertie was given a lousy education, zero encouragement, and no real responsibilities until he inherited the throne in late middle age. Historians have treated Bertie no more kindly than his parents, but in her biography The Heir Apparent author Jane Ridley persuasively argues that Bertie was a better man and monarch than his detractors claim. Bertie (1841-1910) was the eldest son of Queen Victoria and Prince Albert’s nine children. His older sister Vicky, Empress of Germany and mother of the infamous Kaiser William II, was a bright child and as her father’s favorite received an excellent education. On the other hand, Bertie’s parents decided early on that he was a dolt and treated him accordingly. One would think that massive attention would have been paid to the educational needs of the heir to the British Empire, but Victoria and Albert entrusted the Prince of Wales’ education to unimaginative, second rate tutors and a Spartan regimen. Released from his gloomy childhood, Bertie embarked upon the life of pleasure for which he is well known. His marriage to Danish Princess Alexandra, of whom he was genuinely fond if not faithful, didn’t stop him from affairs with dozens of women including Lillie Langtry, Alice Keppel, and Lady Randolph Churchill. Bertie was a generous patron and remained on friendly terms with most of his former mistresses. Since Queen Victoria didn’t share her responsibilities, Bertie was unusually ill prepared when he ascended the throne at age sixty. But as Ridley points out, in some respects he surpassed his mother. In sharp contrast to the widowed Victoria, who spent the last forty years of her life in virtual seclusion, Edward VII made himself extremely visible, opening hospitals and Parliament, something Victoria rarely bothered with. He reintroduced splendor, ceremony, public display and traveled extensively. He was sensitive to the concept of a constitutional monarchy, a notion that Victoria, an absolutist at heart, didn’t fully embrace. In 1901, with monarchies teetering across Europe, Bertie’s visibility was more than just for show. On the eve of WWI, Bertie demonstrated deft diplomatic skills, especially challenging as he was related to all the major players, specifically as uncle to Kaiser William of Germany and the Czar of Russia. Edward VII died in 1910 after a nine year reign. He was a better King than expected, but it is intriguing to contemplate what kind of ruler (and man) he could have been under different circumstances. They drank, smoked, took drugs, had multiple sexual partners, earned their own money, wore short skirts, and rejected traditional female roles. 1960s feminists? Nope, 1920s flappers. In Flappers, Judith Mackrell tells the story of six stylish women who broke barriers and lived large in the 1920s, decades before the feminist movement. As benefits the “flapper” label, African American dancer Josephine Baker, artist Tamara De Lempicka, wealthy Brits Diana Cooper and Nancy Cunard and Alabama gals, Tallulah Bankhead and Zelda Fitzgerald partied (seriously!) and primped, but underneath it all was the desire or the necessity to forge an independent life. A global depression and looming political unrest contributed to demise of the flapper era. By the 1930s, with the exception of Diana Cooper, who effortless transitioned into her role as a conventional political wife and mother, Mackrell’s women were emotionally and financially exhausted. But in their prime, these six women burned red hot, laying the groundwork for a later generation of liberated women. The daughter of a government worker, Empress Dowager Cixi was not an heir to the throne of China nor as a woman could she be, but despite these handicaps, she successfully ruled one third of the world’s population for almost fifty years. In the summer of 1852, the future Empress Dowager was a low ranking concubine in the court of Emperor Xianfeng. When she gave birth to his son, she was promoted to number two consort, second only to Empress Zhen. When her son inherited the throne in 1861, Cixi launched a coup against the regents and put herself in charge. And there she remained until her death in 1908. Her long rule was even more remarkable because traditional Confucian political culture prohibited female monarchs, so Cixi governed through her young male heirs, first her son and later an adopted son. Not that anyone was fooled by this charade, but Cixi was careful to at least keep up the appearance of womanly deference. Early in her reign (or her more accurately her son’s reign), Cixi realized that China must modernize. The devastating opium wars brought home to Cixi the necessity of abandoning China’s long standing “closed door policy” and engage with the West. Positioned behind the yellow screen from which she was obliged to conduct imperial audiences, the hardworking Cixi’s red inked decrees touched every aspect of Chinese life. Railroads, steam boats, telegraphs, and newspapers were introduced. The elitist educational system was overhauled. (At the time, 99% of the population was illiterate.) Commercial, civic, and criminal laws were rewritten and trade policy established. Cixi also banished the ancient custom of foot-binding for women. As an absolute monarch, Cixi didn’t have to listen to anyone, but she was remarkably open to ideas from both domestic and foreign advisors. As Chang points out, Cixi made some mistakes. But unlike most imperial leaders, she admitted her mistakes and strove to make amends quickly. Cixi’s reign was never dull. She endured and triumphed over revolutions, coups, betrayals, exile, famines, and foreign invasions. A fascinating look at a dramatic period of Chinese history and a dynamic female leader. Elizabeth Colton Walls is never dull. 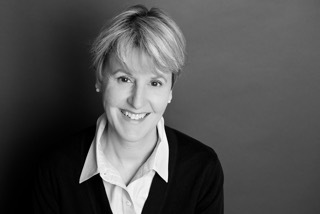 You can check out her most recent prior post at Bacon here or her beautiful website here, which also features regular book reviews in addition to important real estate news. Elizabeth, great recommendations! I love biographies! oooh….juicy selections! I love biographies and look forward to picking these up. thanks Elizabeth! What fun biographies to have on the shelf! Thank you, Elizabeth.